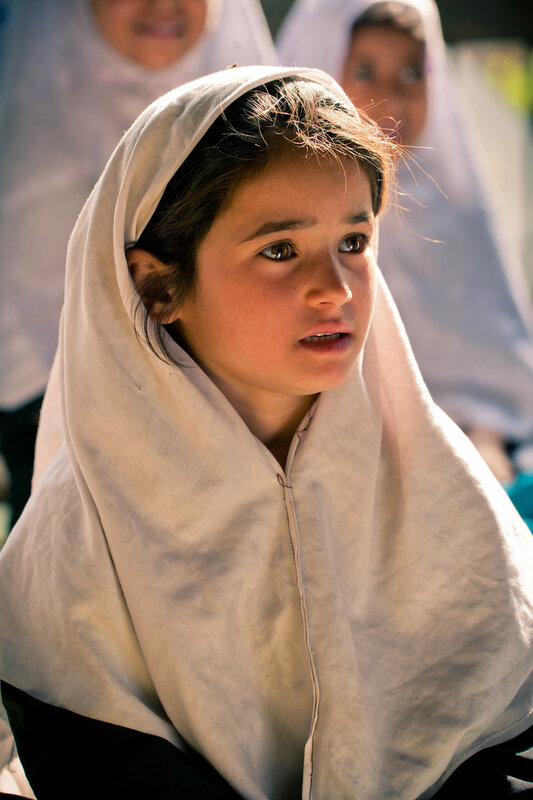 The new feature documentary, ANGELS ARE MADE OF LIGHT, follows students and teachers at a school in an old neighborhood of Kabul that is slowly rebuilding from past conflicts. Interweaving the modern history of Afghanistan with present-day portraits, the film offers an intimate and nuanced vision of a society living in the shadow of war. Below, director James Longley answers some of the most commonly-asked questions from audience members after festival screenings. Why make a documentary film in a school in Kabul? How did you choose this school in particular? We must understand Afghanistan better. In particular, I think it’s valuable for us to understand the reality of ordinary civilians living in places like Kabul. This is the situation of most Afghans - they’re families with kids and grandparents, just like ours, hoping to survive and perhaps thrive. Life in Afghanistan has been disrupted by the actions of outsiders for much of its history. As a US citizen, I can’t help but be aware that my country is directly enmeshed in shaping events in there with our military actions and our alliances for now 17 years. We have made many mistakes in the past and innocent people have suffered. What will we do in the future? Will we use our power intelligently and humanely, to help people? Will we destroy the lives of thousands through indifference or ignorance? Do we even have an inkling of how people in Afghanistan see the world? Generally not - because it’s difficult and time-consuming and often dangerous to gain this understanding first-hand. Who has time? You could say I made this film so that viewers could have a truer sense of the Afghan reality without actually having to stop their lives and move to Afghanistan for three years. But you don’t have to be a foreigner to watch the film; I have heard nothing but positive feedback from Afghans themselves about ANGELS ARE MADE OF LIGHT - something about which I feel both proud and immensely relieved. Getting it right is a struggle. I am just a foreigner with a movie camera. To make a long-term film in Afghanistan requires that the production adapts itself to the environment and shows deference to local norms. A school provides the kind of neutral territory that allows extended filming without putting too much social pressure on any one individual or family. A school is a place of learning - it’s also a good place to learn about a country. The job of a school is to instill the foundational ideas of a society, ideas which - in Afghanistan - have been the subject of much disputation. 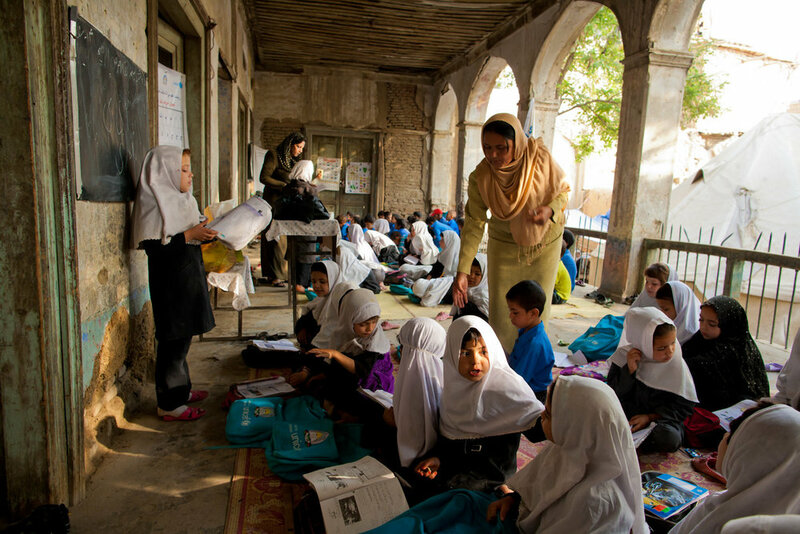 Because children’s education impacts the future, it is also possible to learn something about the future of Afghanistan by spending time in its schools. The fundamental purpose of making a school film in Afghanistan is not to focus on education per se, but rather to make the broader picture visible. The school is the jumping-off point to everything else. In this case, the idea was to reconstruct a Kabul neighborhood and its sensibilities inside a two-hour film. Hopefully, the recreation is faithful enough that an audience is able to form a complex memory of Afghanistan that roughly corresponds to the lived reality of others. We did not come to the Daqiqi Balkhi School right away. We scouted for months in Afghanistan. We visited - I think - seven different schools in Kabul, and a village school in Parwan Province, where we filmed several times. We talked to scores of students. We drank tea with myriad teachers and school principals. We met with parents and administrators and deputy directors. We visited two Kabul hospitals to discuss filming with them. We spent weeks filming at the largest government-run orphanage in Kabul. In the end, I felt that the Daqiqi Balkhi school was the best home for the film. At the Daqiqi Balkhi school Teacher Fazula and her husband, Mir Abdullah, gave us permission to film and interview themselves and their three oldest sons: Rostam, Sohrab, and Yaldash. Being able to film with a family was decisive. The second deciding factor in our choice of school came in the form of principal Faiz Mohammed, who appears several times in the film. Faiz Mohammed had been a school principal for twenty-five years, remaining in Kabul even during the civil war. After the exit of the Taliban from Kabul in 2001, Faiz Mohammed spent his own money to build a much-needed school office and classroom tents in the courtyard of a destroyed mosque. Faiz Mohammed allowed us to film at his school for years - even as the school shifted to a new location - and was exceptionally kind and accommodating. I would have liked to expand his presence in the film, but he was far too shy and genuinely modest for such things. Having permissions from the various ministries, the support of the school administration, the teachers, community leaders, the parents - and most of all the school students - was the key that allowed us to work peacefully and productively for three years. Filming over a long schedule allowed us to become known and accepted by the community, which improved the film. How did you come to the idea of making this film in Afghanistan? Afghanistan was ultimately the right place for this film, something that took much trial and error to discover. Between 2007 and 2011 I tried unsuccessfully to make variations of this same school film concept in Iran and Pakistan. In both cases, larger political events in those countries overtook the productions. In Iran our work was interrupted by the Green Uprising of 2009. In Pakistan, various scandals - including the Raymond Davis Incident and, later, the diplomatic fallout over the killing of Osama Bin Laden - poisoned the political climate to such a degree that filming on my little school project was halted. When elephants fight, it is the grass that suffers. When I moved my film to Afghanistan in 2011, Kabul already felt like a city clinging to stability. Bombings in Kabul were on the rise, the US was leaving, and war raged in the countryside. Afghanistan remains an urgent subject: A forgotten people in a forgotten war zone, where political forces have often trampled the lives of the weak. I felt motivated to make a film that would let people see and hear a local perspective, and understand the struggles of ordinary people. Why does the film focus on men and boys with fewer scenes of women and girls? The Daqiqi Balkhi School operated in three shifts: older boys, older girls - and one shift where very young boys and girls studied at the same time, in separate classes. We were given strict instructions by the administration never to film the students of the older girls’ shift. This left only the option of trying to include the voices of girls from among the very youngest students. The whole subject of filming girls in Afghanistan can be quite fraught, and requires special circumstances to be successful. Filmmakers I know who succeed in filming documentaries with women in Afghanistan are generally themselves women, often working with a female crew in an all-female environment such as a private girls’ school. In our final year of production we finally managed to begin filming in Teacher Hasiba’s class of first-grade girls. But with the exception of Sita, a girl who was slightly older than her classmates, we were unable to record strong interviews with such young students. As far as filming the boy students was concerned - in Afghanistan this is far more socially accepted. Unlike girls, the boys we included were relatively easy to film outside of the sanctuary of the school, in their neighborhood and around the city. Girls, by contrast, were rarely seen outside their homes or the school. Significantly, we could film the boys we recorded over a long period, as they got older - essential for a longitudinal film. It was more practical to record interviews with the male participants in the film; the women with whom we recorded voice-over interviews required their husbands to be present, and it was a greater imposition to ask both parents to be away from their work and families for the recording sessions. In the school, where most teachers were women, only two or three women teachers ever allowed us to film during their classes. The gender separation of the local culture created a situation where the majority of our usable material was of male teachers and students, because we could film them most freely. Nonetheless, we have worked to include well-defined women’s voices in the film, including the most salient political ideas of the documentary, expressed by the school custodian, Bibi Rogul. I am also happy that other documentaries exist, such as WHAT TOMORROW BRINGS by Beth Murphy, that - filming with a female crew - focus in on the subject of girls education in Afghanistan more deeply than I could hope to do. It is liberating for a director to discover that their film need not address every issue. That said, our film takes a backseat to nobody when it comes to containing powerful political ideas and sincere observations made by women about their society. The ANGELS ARE MADE OF LIGHT film exists partly as a vehicle for those brave voices to express uncomfortable truths that are hanging on the lips of the country. Is the film scripted? Did you direct people in the film? All of the scenes in the film are edited from unscripted, observational material. All voice-over internal monologue material is edited down from unscripted audio interviews with the participants. I wrote out questions around which my Afghan colleagues would have conversations with the people in the film while I recorded them. Our English transcript wound up being over 8,000 pages. We recorded some 500 hours of picture. The motivation behind collecting this hoard of material was to put together a film that felt more transparent and unmediated. In other words, I wanted to erase the sensation of a camera as much as possible, to have the feeling of being in a place with people, and not being a stranger. This familiarity was the thing that needed the most time, but it was necessary because familiarity is what I’m giving to the audience. On this film, more than before, I developed a filming instinct anticipating a formal approach in the edit. I got into the habit of deconstructing everything that happened around me into the elements of an imagined edited scene that I was simultaneously constructing in my mind while reality played out. I only had to be patient and then fast enough to catch it. If there was a technical glitch during filming - say a camera shake - or if the fourth wall was broken, I made a mental cut and started the shot over. Then I would move the camera to the next setup that I imagined in my evolving internal storyboard. Filming in this way, with an imagined future edit hard-wired into my camera habits, it was later possible to cut together scenes that resemble the composed shot-by-shot flow and invisible camera that we more strongly associate with fiction filmmaking. Some young people have told me after screenings that they had no idea the film was a documentary while watching it. I am okay with this. It was a conscious decision that the formal visual style of the documentary would be Fiction, and I stuck to this approach throughout filming and editing on ANGELS ARE MADE OF LIGHT. That is, I determined to make a completely unscripted observational documentary, adhering to a policy of non-interference, but to do so in a consistent language - something that might deceptively suggest it had all been shot in 27 days on a Hollywood backlot by unionized labor. I’m only half joking; I tend to like fiction films more than documentaries - I mean, formally. Fiction filmmakers always knew that they were making art. As a general stereotype, documentary filmmakers tend to be more ready to sacrifice formal qualities in favor of some story element they deem important. I am looking elsewhere for the truth. Most documentary filmmakers don’t mind if the microphone boom gets in the shot. But I do. Those kinds of intrusions of the filmmaking process break the illusion of presence in a documentary just as they break the world of a fiction film. In ANGELS ARE MADE OF LIGHT, the formal approach is directly related to how I want Afghanistan to exist in the imaginations of viewers. I don’t want Afghanistan to be a fearful jumble in your mind - I want the audience to experience clarity on the subject of Afghanistan - at least clarity about the complexity. Instead of having the film be a traditional narrative story, I decided to have a film that contains layers of stories - stories of culture, history, politics, religion and so on - all told through the people. The formal approach is motivated by my desire to build an approachable cinematic recreation of the subject, in which form follows idea. For example: I’m not a religious person, but the formal qualities of the film are designed to convey a sense of religiosity; some scenes look and feel like Bible stories. Religion is a strong current in Afghanistan; the film should convey this flavor to the viewer. Fiction is a film language that everybody understands, and it can be auspicious to speak it when documenting and understanding subjects in the real world. I imagine my work as a documentary maker to be the collapsing down of reality into a form such that the main ideas are preserved and can be unfolded and understood by someone else in another place, after the fact. Fiction filmmakers have already done the heavy lifting of creating a cinematic language in which most everyone is fluent. Why not accept this core language and build on it to explore the complexities of the real, unscripted world? There are more meaningful things to be done with film form than merely constructing individual narrative arcs that are selected for their dramatic content. Translating collective lived reality and big-picture situations into a coherent cinematic language is a filmmaking problem that interests me. Why did you choose to include so many people in the film? The film features eleven different people with their own voice-over narration. For a documentary, this can be a lot, but it felt correct for ANGELS ARE MADE OF LIGHT. A traditional story arc following an individual character seemed wrong here. The social paradigm of Afghanistan is family- and community-based; people are quite interdependent. Consequently, there is societal pressure not to stand apart from others. On a practical level, because everyone knew we were recording many different people at the school, it made being filmed easier - socially - for all participants. There were a number of other teachers and students who were filmed and interviewed, but whose fascinating scenes and personas were cut from the film - something that gives me constant sorrow. Still, we wound up with a wonderful sweep of viewpoint in the film. Not only is it appropriate to Afghan culture, but having a wider range of voices in the film also helps convey a nuanced view of Afghanistan. The idea of the documentary is to give audiences a sense of a place and the people who live there. Its was not to record the story of just one person, but to communicate something more expansive. It was important to include many different perspectives on the neighborhood world of the film, to make our reflection on this small corner of Afghanistan more multidimensional. Were there safety issues filming in Afghanistan as an American? I did not feel myself to be in danger while filming in Afghanistan. I rarely met an unfriendly person. I kept a low profile, living in a house behind a ministry near the center of Kabul, with other foreign journalists. We had no guards or weapons; our wooden door opened onto the street. I tried not to keep a regular schedule or a regular driver. We sometimes walked across Kabul to film at the school and environs, or took taxis. Mostly, the key to remaining safe in Afghanistan was to have good relationships with the local crew and with the communities where we lived and filmed. By the time I left Kabul, strangers would call out my name as we walked past their shops on the main streets of Jada-e-Maiwand. After 200 filming days on location over our three-year production schedule, the presence of our small crew had become a minor fixture in the area, and local acceptance of us and our film project helped keep us out of harm’s way. With sound recordist and assistant director, Saboor Arghanidwal, filming in a Kabul market. Popping into frame left is Hikmat, a boy whose younger brother, Naveed, was killed next to him by a suicide bombing. Hikmat’s interview about the incident can be read here. It is the realest account of a suicide bombing you will ever read. Also, it should be said that Kabul remains one of the safest places in the country to be a foreigner, despite the bombings and the odd kidnapping. However, I didn’t encounter many other foreigners wandering the neighborhoods where we filmed. Afghanistan is an unpredictable environment. One can always be at the wrong place at the wrong time, or be targeted as a foreigner, or simply be misunderstood. What we did carried a risk. We were fortunate to have no problems over the three years of our production. For this good fortune, I give full credit to Afghan hospitality. What is the source of the 35mm archival memories in the film? There are three short archival sections in the film: The time of the kingdom, the communist revolution and Soviet invasion, and the civil war in Kabul. Audio interviews with two of our older participants, speaking from the depth of their lived experiences, narrate the historical sections, which appear in the film as their memories. We worked with the Afghan National Film Archive and Afghan Film to find material that could give a broad-strokes outline of defining events in Afghanistan’s recent history, and help those moments come alive. The story of the ANFA is fascinating by itself, and was made into a documentary called A FLICKERING TRUTH by the Kiwi director Pietra Brettkelly. The archive have since shifted to an UHD film scanner, but at the time I was obliged to record the 35mm celluloid images off the ground glass of their last good Steenbeck flatbed with a 100mm macro lens. One deep regret of mine was not being able to spend more time exploring the extraordinary world of Afghanistan’s past hiding inside those stacks of old film cans. How did you find filming in Kabul? 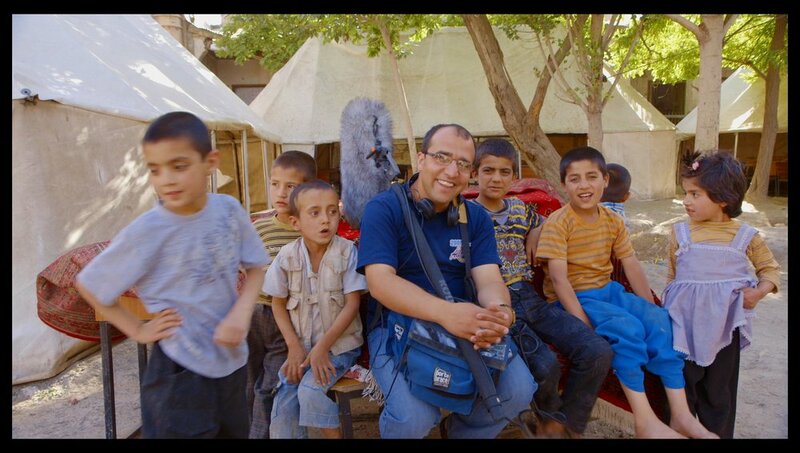 Filming in Kabul was a joyful experience, mostly because of the patient hospitality of Afghan people. While I was working in Afghanistan I felt inspired to push ahead in the process and challenge myself to be a better filmmaker; every day I spent with Afghans convinced me that this is a country that needs to be seen and understood, and I had some sort of duty to convey that understanding through the work. That idea kept me going through the years-long process. Also, it was enjoyable to spend so much time with Afghans during production, and to know the place. It was a privilege to be among Afghan people; I was in no particular hurry to leave Afghanistan. Every time I went out to film I could look forward to some new discovery, some new idea. It was tremendously gratifying to be working freely on a long-term film, and to fall into that rhythm of work that becomes like the rhythms of a farmer. Filming, translating, eating, sleeping. Inside work and outside work. Different jobs for different seasons. I wanted to mark the passing of years in film time with snowfalls. On dark days when the school was on winter vacation we would often spend days at home, translating the myriad scenes. But if we woke to snow falling, it was obligatory that we trek across town to capture images of our neighborhood to mark the season. Getting out to film made a refreshing change from all the sitting on cushions, translating page after page of Dari into English, hour after hour of video. The scenes we filmed at the school of Qur’an classes were the biggest challenge for translation. In the footage, the Qur’an teacher would recite a verse - and then we in translation would go scrambling through the Qur’an to find the verse he’s quoting, and then we looked up the verse online to use the vetted translations of every Qur’anic line, the exact beginnings and ends of verses delineated by a forests of timecode. In the end, we never used any of those scenes. I’d say we used less than one percent of what was recorded and pored over and translated for the film; that unseen 99% of work below the surface still mattered at least as much as what wound up on the screen. Breaking up the activities of filmmaking kept it enjoyable. If I could have, I would have loved to have filmed every day. But each day of filming or interviewing could easily generate two days of translation work. I far prefer filming to translating, and so came to regard the meticulous translation work we did as the price of taking out the camera and filming material, which for me was nearly always an exuberant joy. Kabul is a city that has a great abundance of character, visual and otherwise, and each day filming at the school or on the streets of Kabul was a wonderfully meditative experience. On the other hand, typing out my own transcripts probably enforced a form of discipline on my filming that I might otherwise not have had, and it allowed me to be immersed in the language and ideas of Afghanistan far better than had I simply hired someone else to make the translations. How did you record the sound in the film? Can you say more about post production? I knew that I wanted to experiment with creating an immersive audio environment in the film. Before I went to Afghanistan I attended IBC in Amsterdam and looked at all the various solutions that were available for recording surround sound in the field. I needed an immersive audio solution that could work with a two-person crew in Afghanistan, often filming outside. Eventually I chose to use ambisonic recording, or single-point surround as some people call it. The microphone records a spherical image of the sound pressure onto four audio channels. You can then manipulate this information in post production - to change the orientation of the sound, for example. Then it was simply a matter of teaching the local crew members to hold the microphone correctly and adjust the levels. If we needed to change the tilt or rotation of the aural stage to match the picture, we could accomplish this later in the sound studio using a software plug-in. Those four channels of surround sound formed the foundation of our sync audio. We recorded everything in surround. I also had a good shotgun microphone on the camera - but combining the shotgun with the ambisonic recordings could be problematic because of phase cancellation, so mostly it was a choice between those two mics for location sound. We only rarely used wireless mics. I would sometimes wire up one of the kids we were filming in the school, for example, but we rarely got audio I liked that way. Wireless came in handy for having an extra mic placement, such as for recording the sound of the Imam in the neighborhood mosque; We could tape a lavalier microphone to the bottom of the Imam’s microphone and get great sound of his entire sermon while I captured coverage of the congregation. For those kinds of things, wireless was handy, but I don’t like to put lav mics on people if I can help it. It’s a lot to mess with for a novice sound person, and anyway I like to hear the environment in natural balance with peoples’ voices in location recordings. For the many, many interviews we recorded with people in the film - the interviews that make up the VO narration - I recorded everything with a U87 microphone, which has a sound that is familiar to us because it’s an old workhorse of sound studios and movie dubbing stages for the last 50 years. I wanted the voices of the people in the film to take on cinematic scale - they had to fill the theater, acting as the internal monologue, the train of thought of the film’s participants - and I think having that familiar studio microphone sound helped to do that. Sometimes we recorded the audio interviews in peoples’ homes, sometimes we recorded in little recording studios that have sprung up in Kabul like mushrooms. One studio space had an auto mechanic shop just behind the wall that gave forth a continual clanging. It turned out the studio was never used in the daytime; the musicians who owned it only used it at night after the mechanics went home. I had to buy the auto mechanics lunch so they could take a break while we recorded our interview. 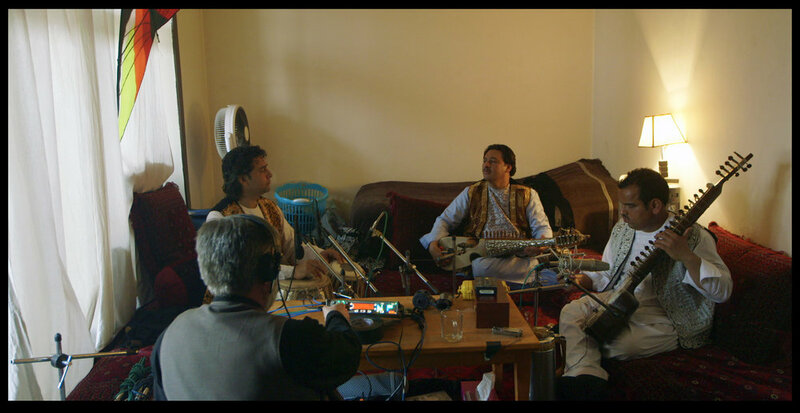 I wasn’t sure during filming what I was going to do for music in the film, and so I hired a number of local Kabul musicians to record themes and various songs and instrument samples, in case those were needed later. As it turned out, Norwegian composer John Erik Kaada made the music, working with Norwegian musicians - and his own massive instrument collection - to put together the original soundtrack for ANGELS ARE MADE OF LIGHT. So none of the music recordings I made in Kabul were ever used in the film - but it was certainly a pleasure to produce them. In the final mix we decided to go for Dolby Atmos - which I think makes ANGELS ARE MADE OF LIGHT the first verite-type doc to be mixed in Dolby’s new object-oriented sound format. We worked in Denmark with Henrik Garnov, or Gugge, who was the re-recording mixer and chief sound designer, along with Thomas Arent. Gugge and Thomas mixed first in a 7.1 environment before we moved to the Atmos mixing stage, doing things like orienting all of the ambisonic surround images, and the infinite minutia of sound design and foley. Despite having excellent field recordings, I know they also employed some foley in the mix of things like the Shiite flagellation scene to give sounds more separation in the Atmos space. We also did things like - once we brought a bi-lingual Afghan boy, Emran Nourestani, into the Copenhagen studio to record him calling out the word “teacher!” in Dari so we could have that word in isolation, and use it to pull us out of an archival section back into a classroom scene. So that part of the audio was actually a post-effect, and not something that was recorded on location in Kabul. There were a few things like that. The experience of doing an Atmos format film got me thinking a lot about how to expand my use of sound in the future. It’s such an underrated part of filmmaking and the filmgoing experience; one can never have enough sound mixing days. Like the original score, picture post on ANGELS ARE MADE OF LIGHT was done in Oslo. The colorist was a kind gentleman named Tom Christer Lilletvedt, working with our picture lab, Hinterland. We discussed the look and feel over Skype, and I made several trips up to Oslo from Copenhagen to direct the color, as well as a lot of emailing back and forth of movie frames marked up with framing notes. I wanted a look for the film that was warm and inviting - how I felt about Afghans. I wanted a look that was the polar opposite of films set in Afghanistan such as ARMADILLO, which is all cold, inhuman blues and greens to match the mentality of the foreign soldiers it focuses on. For ANGELS ARE MADE OF LIGHT, I wanted a tonality in the color palette that would gently pull the audience into the world of the film and allow them to feel welcome among its inhabitants. Picture editing and sound mixing were done in Copenhagen. The bulk of the editing was done working with Waltteri Vanhanen, a young Finnish editor who had just assisted on Yance Ford’s documentary, STRONG ISLAND. During the last three months of the cut we also had the chance to work with Janus Billeskov Jansen, who is - in my opinion - the greatest living Danish cinema editor. Working with Janus was a highlight of the edit, and his expertise added a lot to the film.